Then fortunately for the loggers, along comes the 100-foot-tall Paul Bunyan with his 50 foot tall blue ox named Babe!!! The loggers were very thrilled to see this legend, and they excitedly explained their predicament to Paul. So Paul and Babe climbed to the top of the tallest mountain and looked down upon the scene below to see why the logs were not making it all the way to the saw mill. 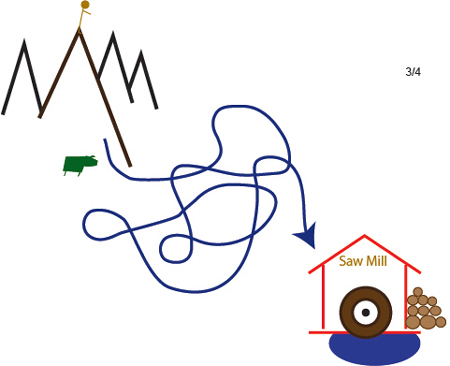 They saw that the river did NOT flow straight to the saw mill! The river’s course went in curves, bends and cross-flows! There were backflows. There were whirlpools. There were log jams at all of the places where it had backflows and cross-flows! The logs were just piling up and making lakes! However, very few logs were actually getting to the saw mill (their customer) so the loggers were not getting paid.